A drooping eyelid caused by excess skin or hooding of the eyelid, ptosis (levator muscle problem), or heaviness of the eyebrow, can not only make you feel less attractive, but can also impede your vision. 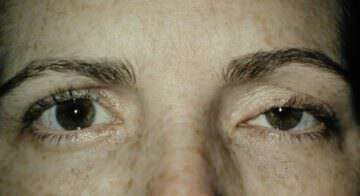 The condition affects both men and women, and the extent of the repair depends on the amount of skin excess, the lid muscle condition, and the position of the brow. Blepharoplasty: The eyelid folds and often pushes the eyelids down and drape over the eyelashes and eyelid margin. Hooding of the eyelids may be a hereditary feature, but is also seen with aging. Blepharoplasty removes some of the eyelid fold and restores a more youthful appearance. Lid muscle lift: Advancement and reattachment of the eyelid muscle (levator), is effective when the muscle function is good. Occasionally, when the muscle has poor function, resection may be necessary. Sling procedure: When the levator muscle function is absent or very poor, a sling procedure is the best treatment to achieve a good lid level. Brow lift: When the brows are heavy on the eyelids, brow lift is required to allow the eyelids to assume a normal position. A skilled oculoplastic surgeon can perform an “eye lift” to restore normal lid level, contour, and symmetry, appropriate create and fold, and good lash position by bringing both precision and keen aesthetics to the procedure. Whereas another surgeon might achieve a good functional result that is not necessarily a cosmetic improvement, Dr. Kaltreider ensures both. You’ll see better and look better thanks to this outpatient eyelid procedure, performed in her Charlottesville office. What to expect. During surgery, you will have either oral or intravenous sedation. After the local anesthetic is in place, you will not feel pain or unpleasant sensations. You may be aware of pressure, some movement, and gentle tugging. You will not be able to “see” the surgery as it takes place. After the procedure is complete, you will be able to open your eyes and will likely sense a greater field of vision. Your eyelids will feel tight, but you will be able to open and close them. It is wise to allow at least a week or two of healing time before getting back to an active lifestyle. Detailed instructions are provided prior to surgery. For the first two days, cold compresses while you are awake will help dissipate the swelling and bruising. Antibiotic ointment applied to the incisions helps dissolve some sutures, prevents infection, and soothes inflammation. (Note: The ointment may temporarily blur your vision by getting into the tear film.) Most patients have a tight feeling in the eyelids for a few weeks. This is normal and resolves usually by eight weeks. Total healing time varies from individual to individual, but generally, you are very presentable by the beginning of the second week, sometimes as early as three days after surgery. Follow-up is very important—early to remove sutures and later to evaluate after swelling has disappeared and lid crease incisions have faded. The stability of the lid position, symmetry, contour, and lid crease are evaluated at the later visit to be sure that you are happy with your eyelid and all parameters are optimal for the health of your eye and eyelids. Blepharoplasty of the Upper Eyelids and Direct Lateral Brow Lift. Direct Brow Lift and Blepharoplasty of the Upper Eyelids created a natural open appearance with better visibility of the lashes. Blepharoplasty of the Upper and Lower Eyelids. Myogenic Ptosis Repair – Bilateral Fascia Lata Frontalis Slings – Before & After. This patient has myogenic ptosis and had several operations prior to visiting me. A bilateral fascia lata sling procedure allows her to open her lids with the frontalis, while permitting complete closure at night. Congenital Ptosis Repair – Bilateral Fascia Lata Frontalis Slings. Repair right side – Levator advanced and reattached. Now the left upper lid is slightly lower because of Hering’s Law of Equal Innervation. Bilateral Repair – Levator advanced and reattached. Repair both sides – Levator advanced and reattached. Repair Left Upper Lid – Levator advanced and reattached. When unilateral surgery is performed, it is up to the patient to decide whether to remove skin on the other side. If blepharoplasty is not desired on the non-ptotic side, then little or no skin is removed from the ptotic side. This patient would have benefited from bilateral cosmetic blepharoplasty in addition to the levator repair on the left side. Repair Both Sides – Levator advanced and reattached. This patient would benefit from lateral brow lift on both sides. Some of the skin laxity remains in the lid fold to allow brow lift at a later date, and to avoid pulling the lateral brows onto the eyelids. Congenital Ptosis repair Right Upper Eyelid – Levator resection. This young lady had Jaw Wink or Synkinetic Ptosis. The abnormal movements with jaw action were minimal, but the ptosis was bothersome – therefore, a levator resection was performed. Epiblepharon before and after blepharoplasty. Congenital ptosis with good muscle function before and after.